Spending a few days in Vienna? 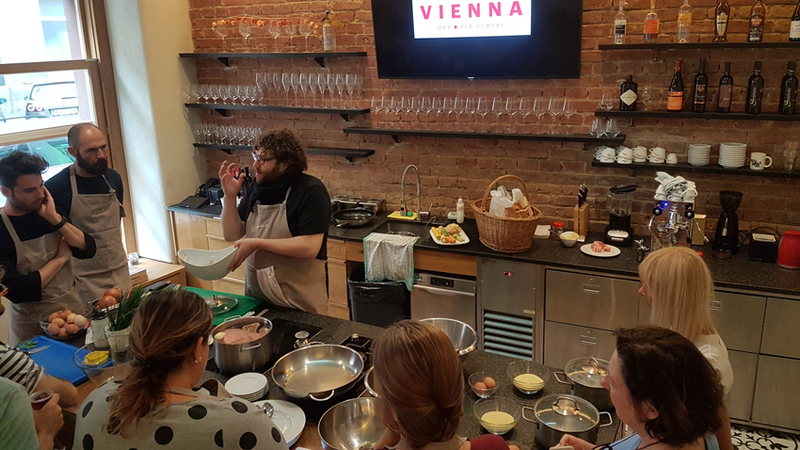 Interested in learning more about Viennese Cuisine? Want to meet the locals? Here is the perfect opportunity! At Andante we offer regular cooking classes on Austrian and Viennese Cuisine in English every Tuesday evening! Join us on a culinary journey through Austria! 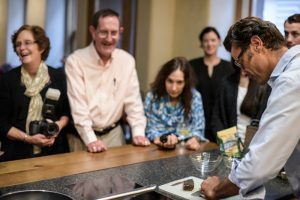 Meet our passionate staff and spend a few most memorable hours at our culinary atelier. “Kartoffelsuppe” (potato soup), “Grießnockerlsuppe” (clear broth with semolina dumplings), “Krautfleckerl” (typical cabbage-pasta dish), “Wienerschnitzel“ (too famous to need a translation! ), “Tafelspitz” (tender boiled beef), “Zwiebelrostbraten” (roasted beef with onions), “Paprikahendl” (chicken in a pepper sauce), “Kartoffelgulasch” (stew with potatoes), “Kaiserschmarrn” (the emperor’s favorite dish), “Topfen- & Apfelstrudel“, “Buchteln” (yeast dumplings), “Marillenknödel” (apricot filled sweet dumplings) … these are just a few examples of the local specialties we will all fix together. So when you return home, you can surprise and impress your friends and familiy and treat them to a home-made Austrian dinner. There is no better souvenir to take home from Vienna! We are located in the third district, one block away from the “Hundertwasserhaus”. Are you traveling by public transportation? Take the streetcar Nr. 1 and get off at “Hetzgasse”. Alternatively, take the U4 or U3 to “Wien Mitte” , hop on the streetcar Nr. O and get off at “Radetzkyplatz”. From there it’s only a short walk; seriously! Every Tuesday, we will be cooking a three-course-menu based on seasonality, availability of certain products, size of our class, and also your own preferences. All our courses are held in English. Additional languages (German, French, Spanish, Italian) upon request. Small group visiting on another day? Drop us a line, we might be able to work out something for you!